Wednesday afternoon, a beloved member of the Falcon Heights community, Philando Castile was murdered in cold blood by a cop too afraid of his own shadow to allow a legal gun owner to provide his ID. Moments after a St. Anthony cop abruptly shot her boyfriend to death in front of her 4-year-old daughter, Diamond Reynolds live-streamed a video on Facebook depicting her dying boyfriend drenched in blood and sitting beside her. According to recent reports, Reynolds’ daughter was inside the car when the cop opened fire. 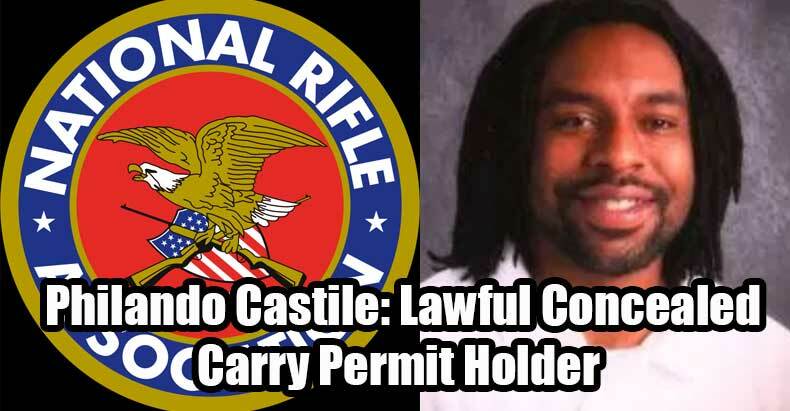 Castile had committed no crime, he was complying with the officer’s orders, and yet the mere fact that he told the cop he was lawfully concealed carrying led to him being killed. Before Castile was murdered, a graphic cell phone video surfaced showing two officers execute Alton Sterling at point blank range as they held down his arms, Sterling was also carrying a pistol. Sterling, Castile, and the multiple Dallas cops all died senselessly. However, the NRA only chose to reflect on the police officers’ deaths. While it is unclear whether Alton Sterling’s gun in his pocket was licensed, the one in Castile’s pocket was. The silence of the NRA in this tragedy has prompted its members to lash out. As Fusion.com points out, the fact the NRA has commented on the Dallas police officers’ deaths but not the death of a black man licensed to carry a gun is not surprising. Second Amendment protections have often been denied to black citizens. Martin Luther King, Jr. couldn’t even get a concealed carry permit after his life was threatened. The NRA has historically not commented on individual or mass shootings, but the NRA does have a close if fraught relationship with American police forces. After news of its members becoming outraged over their silence, the NRA released a statement Friday afternoon that resembles more of a police department statement than anything else.